Mentally or physically disabled people and elderly people are now to be seen with increasing frequency on the theatre stage. With the appearance here of different bodies, which do not comply with the prevalent concept of normality, the image that our society has of itself also changes. In the theatre a society stands face to face with itself. It draws its own self-image and defines its concerns, the conflicts it intends to deal with and the values it wishes to discuss. Certainly in recent years dimensions such as the making of experiences or the changing of perception have commanded increasing attention in the theatre, yet the representative function of theatre as a medium of the public still plays a central role despite all performative changes. For centuries, strict selection criteria determined who should be allowed to represent us. Future dancers already had to have a certain physical disposition in order to begin their training, in which until quite late in the twentieth century they focused above all on the technique of classical ballet. Technically accomplished and physically disciplined, they were finally able to present an ideal image of the body. In its interaction on stage and its hierarchical gradation from corps de ballet to étoile, the star, a ballet company represented an ideally structured social order. Although contemporary dance techniques such as, for example, contact improvisation called into question these outdated hierarchies, the changing of techniques did not involve a change in the representative function. Due to certain skills a dynamic, flexible society, based on the principles of exchange, is now being presented in place of a rigid societal system. For more than twenty years now different bodies have been increasingly thrusting their way onto the stage. Bodies that do not comply with the ideal concepts of the youthful and slender bodies displayed everywhere by the advertising industry. Bodies that bring with them neither classical nor contemporary techniques in order to dance. And with them people step onto the stage who were not to be seen here up to now. Mentally or physically disabled people, old people, who despite being an essential component of our society were for a long time outside the focus of political interest. As early as 1997, in Bound to Please, the British choreographer Lloyd Newson, together with his group DV8, posed the question as to societal conformity and what the audience wants to see by putting an older female dancer in the centre of his piece. With its new production of Pina Bausch’s piece Kontakthof from 1978, the Wuppertaler Tanztheater is enjoying great success because it shows older people in search of love and togetherness, thus touching on a taboo that separates age and eroticism. The dancer and performer Raimund Hoghe adopted the motto of the gay Italian artist Pier Paolo Pasolini - “Throw the body into the fray” – in order to make politics with his body. In his pieces Hoghe, who developed a hunchback in his early years due to scoliosis, claims for himself a space of beauty beyond conventional concepts. In so doing, he also constantly raises the question, against the background of German history, as to the ostracism and persecution of different bodies, which he often evokes vicariously in his pieces. 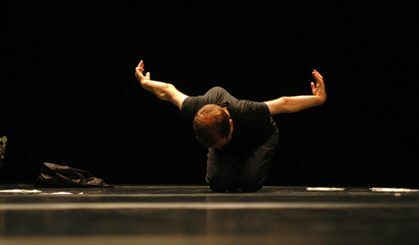 In his piece Disabled Theatre the French choreographer Jérôme Bel works with eleven actors from Zürich’s Theater Hora, all of who were born with trisomy 21, i.e. down’s syndrome. Bel does not have them play roles, instead he gives them tasks which they then carry out in front of the audience in their very own way. Thus he might ask them, for example, to introduce themselves with their name, age and profession. Or he asks them to dance a small choreography of their own to one of their favourite pieces of music. No matter how incomplete this may look by conventional standards, their dance nevertheless strikes a chord with the audience. By introducing themselves, the performers speak as subjects in their own cause. It is important that this is not done by others for them and in their name. Their speaking and their dancing is tantamount to a self-empowerment in a place where for a long time they had no access due to inadequate skills. Thus the theatre acquires the emancipatory function of making visible that which is non-visible in society and giving it a voice. With the appearance of all these bodies, which traditionally were not allowed to dance on stage, we, as spectators, are forced to confront our own values and prejudices. Many members of the audience rejected Disabled Theater as a “freak show”. One does not want to see people like this acting up in public, one wants to protect them from voyeuristic tendencies. But a judgement like this also always raises the question as to why we actually see them as freaks and not simply as human beings? These people, who speak to us self-confidently from the stage, are important for us. When that which was hitherto strange and different gains access to the theatre stage, then there ensues a shift within the framework and also the self-image of a society. Gerald Siegmund is Professor of Applied Dance Studies at the Justus Liebig University of Giessen.